Although acrylic paint tends to dry quickly, several techniques and additives can extend wet time. This Information Sheet discusses how acrylic paints cure and describes how that process can be controlled and manipulated to an artist’s advantage. Acrylics dry as the vehicle that carries them, mostly composed of water, leaves the film. As water evaporates or is absorbed by the substrate, tiny acrylic polymer spheres are forced into ever closer contact. Eventually they are crowded so tightly that the spaces between them create capillary forces, and water is pulled from the paint film. This capillary action packs the acrylic spheres against one another in a honeycomb-like pattern, and they begin to form a continuous, cohesive film. As this occurs, the polymer spheres, composed of long chains of acrylic, actually deform and partially combine with one another in a process of film formation called coalescence. The drying of acrylic paints occurs in two very different stages, hence drying times must be thought of in two different time frames. The first stage, a relatively short period of time, results in the formation of a skin over the surface of the paint. This is the time that it takes for acrylics to “dry to the touch”. At this point, the flow of water towards the surface is no longer sufficient to keep the paint film wet. Very thin films can feel dry within seconds, while thick films may take a full day or more to skin over. The second stage of drying is the time for the entire thickness of the film to be thoroughly dry. That is, the time required for all of the water and solvent (used as freeze-thaw stabilizer and coalescent) to evaporate and leave the film. This is a most crucial time frame, as the ultimate physical properties, such as adhesion, hardness and clarity, do not fully develop until the film is near complete dryness. For very thin films, this time may be a few days, while films of 1/4 inch thickness or more will take months and even years to be completely dry. Many artists are not aware of this more lengthy drying time. This is the reason that one may find that a rather thick layer of paint has not adhered to the surface when tested a day or two after application. This same layer of paint will also seem very soft. The skin may have dried sufficiently, but the paint in the center is still wet. Regarding development of clarity in gels and/or mediums, one can allow a painting to clear, store it away and later notice that it has become cloudy. The film may have only been partly cured, and is soft enough to allow moisture from the air to penetrate, turning it slightly milky again. Given enough time for more complete drying, these properties should improve dramatically. Temperature, humidity and airflow are environmental factors that influence the drying times of acrylic paint films. By controlling all of these factors, the artist can make use of their advantages. Ideally, the temperature should be around 70 to 90oF during the drying/curing process. Temperatures below 49oF (9oC) will not allow the polymer solids to properly coalesce to form a continuous film, and may result in film failure (cracking, adhesion failure, powdered film, etc.). Higher temperatures, like those reached with a hair drier or heat lamp, can speed drying times up significantly, but overheating can cause bubbling or burn the acrylic film. Likewise, lower temperatures will slow down the drying process and can be used to one’s advantage for increasing the working time of the acrylic paints. Relative humidity in excess of 75% will slow the evaporation of water from the surface, slowing down the drying process. Temperatures of 70 to 85oF and humidity under 75% are ideal for drying. While a moderate and steady airflow in the drying area is favorable for thorough drying, a strong breeze, especially one directly on the paint surface, can cause film formation failure, such as cracking and/or wrinkling. The naturally quick drying time of acrylics can also be a great benefit. Many of the most successful uses of acrylic paint come from people taking advantage of this property, which allows for painting over almost immediately. Unique acrylic glazing techniques, hard-edged applications and quick manipulation of the painting surface would not be possible without these very rapid drying properties. There are no limitations on applying additional acrylic paint layers. That is, an artist can apply acrylic paints while the underpainting is still wet, just skinned over, or has dried for several years. If one is going to apply oils over an acrylic underpainting, then a proper curing time should be allowed to be sure the acrylics are completely dry. For thin films on canvas, this can be 1 to 3 days. Thicker films on less porous supports like masonite may take several weeks to dry sufficiently to ensure proper adhesion. For varnishing, it is best to wait until a painting is completely dry. Otherwise, an excessive level of water and/or solvent may be trapped, which could result in clouding or poor initial adhesion of the varnish. This is more important when the varnish forms a relatively tight, non-permeable film, such as is the case with GOLDEN MSA Varnish. When using more permeable varnishes, such as GOLDEN Polymer Varnish, this is less crucial.Another critical element to consider when varnishing is the substrate. A canvas will allow trapped moisture, retarders and other additives to escape, while metal, masonite or plywood make this migration difficult, and can influence adhesion of the varnish layer. In extreme cases, it can cause delamination or cracking of the varnish. (Refer to the GOLDEN Varnish Information Sheet for a more through understanding of these properties). Generally, the painting should not feel cool, excessively soft or tacky. All of these symptoms indicate an uncured acrylic paint film. Generally, a painting should not be put into any closed-in storage environment until fully dry. The preferred conditions for paintings that are in the process of drying is to have ample air flow over the front and back of the paintings, while experiencing no extremes in temperature or humidity.If a painting is rolled while still curing (a poor storage choice in any event), it will coalesce as a rolled film. Upon unrolling, it will be curved and in lower temperatures be more likely to crack. When shipping artwork, it is important to not allow anything other than air to touch the paint surface. This includes any type of glassine, paper, bubble wrap or other plastic, as these may stick to the surface and result in ferrotyping (transferring a texture to the paint surface).Conservators take many precautions when shipping artwork in regard to temperature and humidity. After packing the artwork, allow it time to adapt to its new surroundings. Acrylics shrink in colder temperatures and swell in warmer temperatures, so it is critical not to roll, unroll, or excessively disturb the painting during this transitional period. On flexible supports, carefully back the work with cardboard to reduce the “bouncing” the artwork will encounter during shipment.If the work is going from room temperature to below freezing temperatures, it is wise to put the packed painting in a lower temperature environment, i.e. 32-40oF, for several hours before taking it outdoors. This will lessen the stressful shock to the acrylic.Conversely, the same rules apply after the painting is received. Do not immediately unpack the piece. Allow it the same chance to re-adjust to warmer temperatures. If it was subjected to freezing temperatures, put it in an area of lower temperature as was done before shipping. Depending on their objectives and techniques, artists have varying needs to keep paint from drying too quickly. They may require longer mixing time on the pallet, or longer blending time on the canvas or other support. There are as many ways to control the drying process as there are ways to control the evaporation of water. High humidity, low temperature, low air movement and non-absorbent surfaces slow the drying of acrylic paint. Conversely, dry conditions, high temperatures, significant air flow and absorbent surfaces speed the evaporation (or absorption) of water, and therefore also speed the drying process.By reducing studio air-flow, lowering temperature, and increasing humidity, an artist can slow down the drying of acrylic paints without additives or altering painting methods. Keep in mind that many studios are under-ventilated to begin with, and it may be better to just be sure there isn’t air directly blowing on the painting while working. It is important to ensure ammonia and other escaping paint additives are not building up in the studio space. Some situations call for chemical agents that retard the drying of acrylic paint. These are usually a blend of several materials, predominantly glycols. 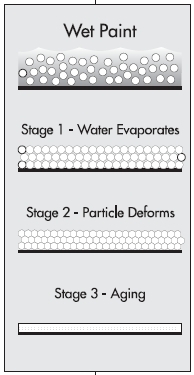 By evaporating far more slowly than water, glycols keep the polymer spheres apart, preventing early coalescence. Humectants, (agents, such as glycerin, that absorb or hold water), also have been added to retard or slow drying. 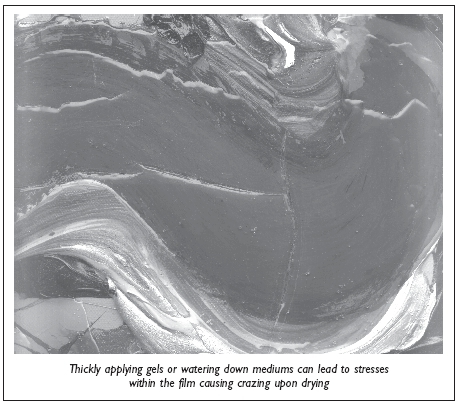 However, humectants must be used with extreme care, as they tend to percolate to the surface of the film during drying leaving a residue that may reduce inter-coat adhesion. Retarders are not very effective if paint must stay wet in thin films on very absorbent surfaces.Paint additives alone will most likely not be effective to slow down the drying process. They must be accompanied by proper environmental factors, a working support with low absorbency and other contributing factors. In addition to additives, several techniques will help keep paints wet on the palette. A most important first step is to use a non-absorbent palette. Glass works nicely, as do plastics such as polyethylene. Glass stays fresh and free from stains, cleans easily and works well as long as it doesn’t break. The problem with a glass palette tends to be the weight. A new commercial tempered-glass palette made in several sizes has convenient hand-sized holes for carrying. Many artists construct their own glass-topped taboret to use with acrylic paints. On wheels, the glass palette is portable and the artist can use larger plates of glass without worrying about excess weight or breakage.To slow the drying of paints on glass or plastic palettes, use a small amount of retarder. About three to ten percent of GOLDEN Retarder will keep a mass of paint from forming a skin for up to six hours, depending on the atmosphere. Using excessive quantities of retarder, especially when working in thicker impasto, will leave the paint skin feeling like soft gum, as the glycol may not totally release from the film.Some people prefer to lightly mist the paint on their palettes. This can be a very effective technique to provide more open time. A simple plant mister, easily obtained at a hardware store, may be filled with water (we recommend distilled or de-ionized) or a 10:1 water/retarder mixture for this purpose. Note again that excessive levels of retarder will result in a weakened paint film that remains sticky. Excessive spraying may cause colors to drip, or to stain the support in an undesirable manner. On the market are several covered varieties of moisture-retaining palettes that help keep acrylic paints in working condition. The most effective is the Stay-Wet Palette®, which takes advantage of what we know about acrylic drying: that is, if one can control the atmosphere, they control the acrylic. The Stay-Wet Palette® is a large plastic tray on which a large, flat sponge is placed. After soaking the sponge in water, a special filter paper is placed over it, and the paper acts as a palette surface. The filter paper allows water vapor to permeate, keeping the paints moist. If the sponge stays wet, paints will remain wet for hours without the use of a retarder. This palette has a cover to further extend working time. Some artists have suggested that this tool slightly dilutes acrylic colors, but if you plan to work outdoors with acrylics on a palette, it may be of great benefit.When paint dries on a glass or plastic palette, the best way for removal is to saturate the dried surface with water, using a very wet sponge or rag. After a period of 3-5 minutes, the paint should be softened and can easily be scraped or peeled off. Canvas and other substrates should be sealed to reduce absorbency, which will aid in keeping acrylic paints wet on the surface. Several years ago an artist called us, complaining that our Heavy Body Acrylic was drying too quickly on her paper. When she first encountered the problem, she decided to slow down the drying by adding more water to the paint. Intuitively, her approach made sense, but when she added water, the paint dried even more quickly. In this case, the drying was not dictated by evaporation as much as by absorption into the substrate (paper). The paper was not sealed in any way. As she thinned the paint, it had less hold-out and the water was absorbed more easily into the paper. Had she sealed the surface first with GOLDEN Polymer Medium or a skim coat of GOLDEN Soft Gel Gloss, the substrate would not have absorbed as much water, and drying would have occurred mostly by evaporation. A cool air humidifier may prove useful to increase the localized relative humidity, and thus slow the drying process. Directing the cool moisture flow on the painting surface will maximize the effect. A cheaper way to achieve a similar result is to use a plant mister set on a very light spray setting. Spraying across the surface at regular intervals will dramatically lengthen the wet time of the paint. Another technique to retard drying capitalizes on the permeability of acrylic gesso. After allowing the gesso layers to completely dry, attach the canvas to a temporary stretcher. Soak the back of the canvas with water, and/or attach wet rags or sponges to the back of the canvas. You have now created a stay-wet canvas. The dried gesso acts as a semi-permeable membrane, allowing water through to keep the paint moist. This technique allows you to paint in relatively thin glazes for hours with acrylics, but beware of some limitations. Cotton canvas may shrink, causing the stretcher to warp and make restretching a necessity. Also, the water may wash impurities out of the canvas and into the paint film. In severe cases this causes noticeable discoloration. These problems will be minimized or eliminated by using scoured (washed) cotton canvas. Or use polyester canvas, which is not dimensionally sensitive to water and does not contain the contaminants found in unwashed cotton canvas. To prevent paint from drying out in storage, be sure not to place it near blowers or heaters. All plastic containers are slightly porous and allow a small amount of water vapor to escape. Also, it is critical to clean the threads of lids and jars. If paint accumulates on these surfaces, the tops will not seal properly and the paints will begin to dry out. Some artists suggest spraying a small amount of water on top of the paint to keep the paint fresh. When spraying, use distilled or de-ionized water to avoid contaminating the paint. Paints will stay quite well in most basements, but should not be frozen. Although most acrylic paints will sustain several freeze-thaw cycles, freezing is not advisable. Tools should be kept wet to keep paint from hardening on them. Avoid storing brushes with the bristles/hairs upward. Even a small amount of acrylic building up over time will get into the base of the ferrule and start to harden the brush. Keep your brushes well-conditioned. Normal hair conditioner works as well as any product marketed for brushes. This will help reduce the amount of acrylic that will stick. A small amount of dish detergent added to water helps remove semi-dried paint from tools. For hardened paint, most of the commercially available brush cleaners will work well, as long as the brush has not been abused. Pre-conditioning brushes with a small amount of conditioner will greatly improve the clean up of your brushes. After cleaning a brush, pat the bristles dry and condition with a small amount of conditioner. Brush the excess onto a hand until you cannot see it.